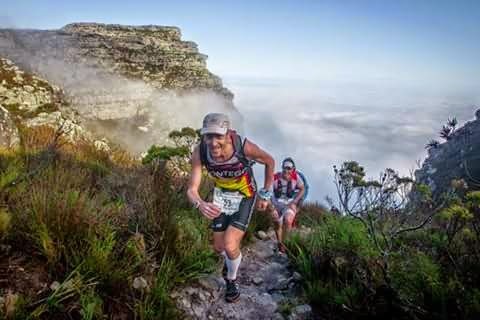 The fact that I was racing a 24km mountain race the week before wasn't a problem. So what was the race that I just had to run? When I was growing up in the '70s my parents would take me (all 5 of us kids) up to the zoo to look at the animals and watch the lions been fed! The zoo is long no more, but the lion enclosure is still there and this would be the back drop for our start... Only fitting for a race called The Beast! After a short race briefing Trevor gave us a 5min warning then I took over 2 minutes, 90 seconds, 60 seconds, 10 seconds. .. Noel then took off and the race started. It was 07h00 and still dark and since I had been on the start line it didn't take long for me to move to the front... not the lead that belonged to some guy who bolted off. 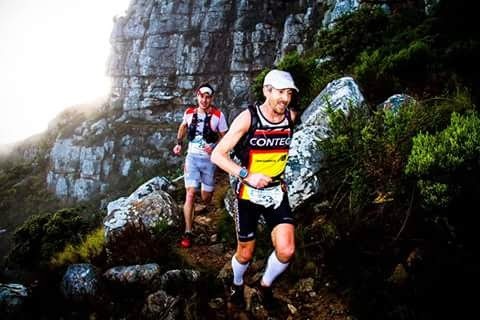 I was in 2nd with Christiaan on my tail and that's how we climbed from the old zoo to the gravel road above Rhodes Men... There was no amazing sun rise as we ran into a thick mist and the guy in blue disappeared. Knowing what lay ahead helped me keep it easy! For a race like this I don’t think you can put time in the bag, because it will break and you will end up hurting and loosing time by the bag loads. I walked up Heart Break Hill and Christiaan pulled up to me and joined me in the walk. In fact over the next couple of km he would fall back a bit and then catch-up on a sections he liked. On the long climb to the cannon we ran above the mist and I took a split to the guy in front. 3 minutes already, who was he and could he really hold that pace? Running over the road the guys had missed him so they couldn’t help us… I could see the rest of the field climbing up so we pushed on. 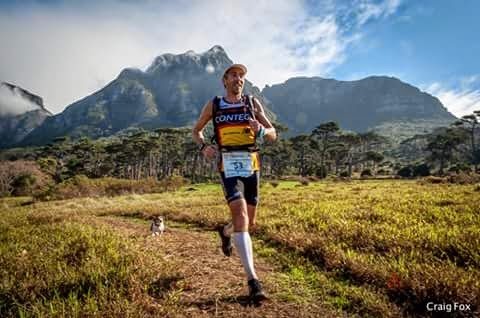 In a normal race I often open a gap on the climbs, but because I was worried about how long this was I wasn’t pushing the climbs, so I was relying on the fact that my easy run is faster than most the chasing fields easy run. I was running this like a weekend long run, only thing is normally I would be planning on stopping after 2-3 hours, and that wasn’t going to get me to the end! 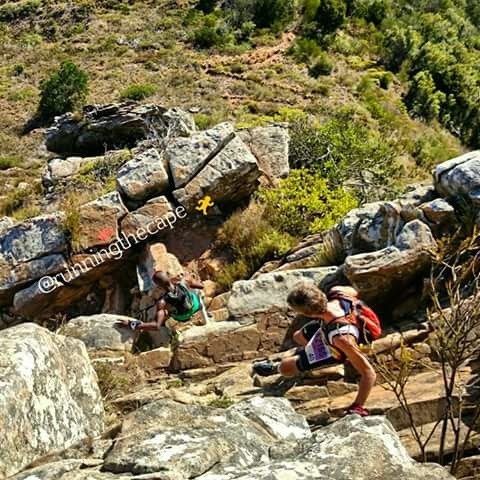 We turned to the Kings Block house and where we had climbed down racing over Easter we went up… Christiaan wasn’t going to pass me on the climb like he had on the descent! I pushed on along the contour and wasn’t taking chance as the morning mist still in the air and some of the rocks were still wet and could have been slippery. We passed a couple of people going in the other direction, they were just out for a training run, and then a marshal said we were leading! Before I know it we were climbing to the saddle of Devils and down to the next contour. We must have been making good time as the tourists climbing up Platteklip were now moving to the side and cheering us on. Bernie had now give up his easy start and was chasing, just still 60 sec back as we dropped to Kloof nek. I was still feeling good and kept the pace honest while the going was easy, Bernie finally caught us as we started the climb in Woody Ravine. 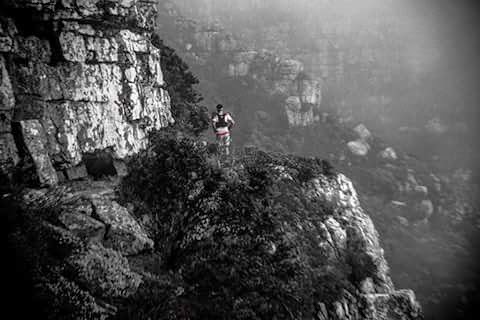 This is really a stunning trail and not one for racing, so the other were happy I set the pace… around the corner and up, I must tell you that we didn’t reall have a view or any idea as to just how long this climb is, we were still in the mist and couldn’t see much! I was surprised at the number of hikers out enjoying the trails and they all were more than willing to let us power walk past them… SUN yes there were sun near the top as the marshal took our race numbers and we turned left and headed to Kasteels with just over 2h30 run and about half the race run we still had a long way to go. Now as you all know the back table along the Twelve Apostils is flat and easy running…. OK it's not so flat! There was a check point at Kasteels and I had my bag off first to show the guys I still was carrying a ton of gear! After downing a banana I was first back on the trail and headed off onto The Valley of the Red Gods, while climbing the ladders to the top I could feel my legs catching up with me. This was my 4th race in as many weeks and it was starting the count against me! The Roving Reporter Stephen Granger was there with a couple of friends taking pictures and watching what was going on, this was the 2nd time we had seen him. Right to the Cable Station straight down Platteklip or left to Maclears… We turned left and headed for Maclears along the face! 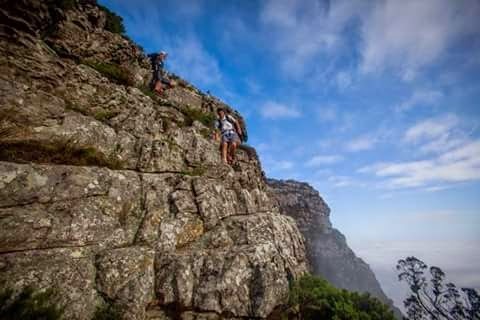 WOW it was amazing running along there with cloud below and cliffs dropping away for those who venter off the path… We didn’t and made good time to the beacon no time to rest as the race was starting to reach the business end. I could already feel that the pace had upped and while I was still driving the race I had nothing to do with it… I was feeling Christiaan wanting to take the lead on the this way that way bends in the path, so I had to push to keep the lead. We were heading back to Platteklip, but turn through Echo Valley… Dropping into the Valley was slow going, while I had wanted to keep the pace up, we couldn’t the board walks were slippery and while I had almost taken a tumble on a couple of time Christiaan and Bernie were also sliding around! The dams were now just below us and with that downhill done it was race time! Or that’s what I though as Christiaan picked up the pace to draw level with me on the road to the dam wall. But he was really just wanting to full up with water… I just waved at the marshals and turned for the wall. I wasn’t attacking but I thought if we keep moving at the effort we had Christiaan might just give-up with a chase if his legs felt anything like mine! Bernie and I chatted as we raced down the road (Garmin was telling me sub 4 pace!) A left turn onto the start on Smuts track let us know that Christiaan was back with us… I was hoping to lead/set the pace till Nursery, but on the first little climb I cramped a bit and had to walk, Christiaan was having none of this and took off with a smile on his face knowing that he had me beat and only had Bernie to worry about. After and couple of seconds stretching I was moving again, but I wasn’t going to be running the hills and those big steps… But other than that I wasn’t too bad I could run the flats and downs. I had lost about 2-3 min on the guys and would loss more time going down Nursery but I think I was holding my own on the flats. OH DEAR the contour path isn’t flat, there is that little bump, The Aloes, as you leave Kirstenbosch… Plenty walking had taken me over and now it was time to look for the path taking us down into Newlands. In the last 30+ years of running in that forest I might have only used that path once or twice, but not for many years. I will have to come and see would fresh legs handle it… Christiaan must have been loving it as he took another minute out of me. We now had joined the 22km route on Woodcutters trail. And I was wonder what was happening behind me and what was going on with the fight for the lead… I was catching a couple of very slow 22km runners (walkers) I was hoping I would see the Bernie or Christiaan walking or cramping, because that would be the only way I could beat them today!!! 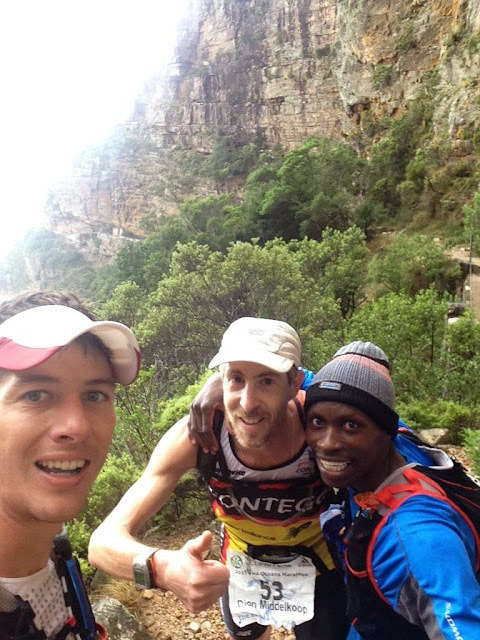 Garmin called it 48.7km with 2100m climb I had finished 3rd in 5h54:07, Bernie had won 5h41 and Christiaan 5h43. What would possess you to even enter a race with that name?! It just screams pain and suffering. But congratulations on the result. You ran great!